as a Chess book reviewer by an Edinburgh Book shop. I get to choose a book and give it the once over. Lubomir Ftacnik I don't know. Danny Kopec I do. will not have been cobbled together in a weekend. I've worked with Danny, we wrote a book together. down on me for using the Edinburgh site for plugging our book. This is the 82nd piece I've done and that was the first plug. point we were trying to get across was perfectly clear. This is not a fault. Oh if only all writers on Chess were so meticulous. sentences until it they had passed teachers examination. sacrificing grammar along the way. and Danny's effort that made it the mini classic it has become. "Those that can, do - those that can't, teach." Danny is one of the exceptions. He can do and teach. known cases ranging from Capa to Karpov. written the review in my head even before the book arrived. category as 'Simple Chess' by Michael Stean. Good books but misleading titles (well they mislead me). Brilliancy Prize for games played in the U.S. Championship 1984-2004. They are not all Wham! Bam! lets sac again type games. Indeed 33 carry on the brilliance going into the ending. who have selected them over other 'best game' entries. So we have the games. Do messrs Ftacnik & Kopec do them justice? hanging on the wall. You walk through and come out and say "That was nice." you what to look for, what to appreciate and how these masterpieces were created. how this book came about. His love of Chess simply leaps from the pages. approach this subject. He is a Professor of Computer Science. Remember what I was saying about Danny being meticulous? The games have been listed in order of RBI (Ratings of Brilliance). categories. The more 'CATS' it has, the higher the game is placed. and Instructive play (for winning a won game). imagine him playing over each game and awarding the 'CATS'. Does it work? Well as Danny himself says when explaining the chart. player will be condemned by another. Does the book need this 'hit parade'? This is unique. I've never seen anything like this before in a Chess book. Good or bad it highlights what I said at the beginning of this piece. and studied every game squeezing the instructive point out of each move. I would be very surprised if this table was Lubomir's idea. with something he is proud off (quite rightly so) and won't let it go. some people, it will not do any harm to those it does not. So, eventually, Winning the Won Game, good or bad? Emmanuel Lasker, World Chess Champion 1894 - 1921. I have played over 6 games. I've no need to play over them all. They are, by the fact that they are brilliancy winners, all good games. for and is well supported with diagrams at the critical moments. for the pleasure of playing over entertaining well annotated games. suffice. As good as the notes are you must study and question everything. space commitments it was not mentioned. well annotated games under one cover is a worthy addition to any library. And basically that is what I'll write and I'll stand by that. and back again gave me time to do that. one could finish 'War and Peace' on that journey. The book appears to have a "Within You Without You." track. (what on earth are you talking about Chandler....Ed). a matter of taste. Some whacko's think this is the best track. was not given much 'air time'(I chose them at random). an excellent game, but it is the least annotated game in the book. What disappointed me was after this diagram. "This opening system suits Yasser Seirawan extremely well. simple tactics to support them." a note when the brilliant sac is played on move 22. Instead we are being force fed variations by 'Fritz'. games fit with the theme, including game 63. Why is game 63 so sparsely annotated - the least in the book? This is really a minor gripe but game 63 is a 'sore thumb'. Never mind, the other 5 games I played over made up for it. that if I thought the book was duff, I would say so. The book itself will prove me right. I call it how I see it. 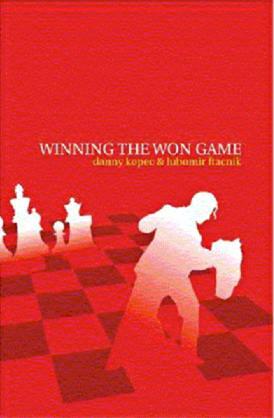 This is a good Chess book. was a pleasure and I know I picked up an idea or two. reviews about this book. Was another cover planned? ?